Some Android users might think that their wish on that falling star has finally come true with the release of Google Docs as an Android app. Available from the Android Market as a free download in English for Android phones running 2.1+, Google Docs allows you to access all of your Google documents from all of your Google accounts. You can even open content while in Gmail. 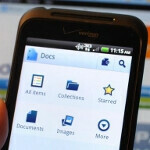 Search, star, edit, rename and of course, read your documents right on your mobile device. A widget is available which allows you to open your Google documents straight from your phone's home screen. 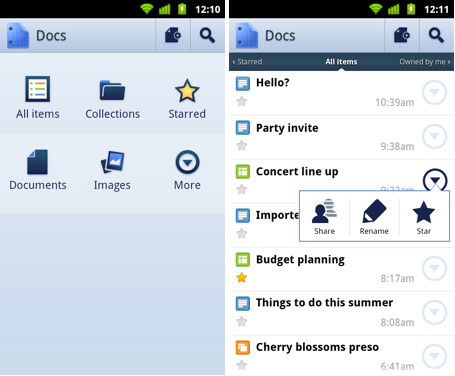 Once on your screen, you can edit documents while on the go and share them straight from your Android handset. And with the app and the camera on your phone, photos with text can be turned into an editable Google document using optical character recognition. Create new documents from just snapped pictures and old shots from your gallery can be converted by sharing them with the app. Google's own blog notes that there are some limitations such as the inability of the app to read handwritten text or some fonts. But the Mountain View company did say to "stay tuned-things will get better over time." YEEEEEEEEEEEEEEEEEEEEEEEEEEEEEEESSSSSSSSSSSSSSSSSSSSSSSSSSSSSSSSSSSSSSSSSSSSSSSSSSSSSSSSSSS!!!!!!!!! !!!!!!!!!!!!!!!!!!!!!!!!!!!!!!!!!!!!!!!!!!!!!!!!!!!!!!!!!!!!!!!!!!!!!!!!!!!!!!!!!!!!!!!!!!!!!!!!!!!! !!!!!!!!!!!!!!!!!!!!!!!!!!!!!!!!!!!!!!!!!!!!!!!!!! *ahem* *Straightens my jacket and regains my composure* Um, er, carry on, folks. That's nice, I've been using a 3rd party app, rather trust my apps to google. It's stuck in an endless loop when I try to open stuff with it but I imagine this will be fixed quickly. Just tested it by taking a picture of this article on my EVO with CM7 N57. https://docs.google.com/document/d/1O_Su0_tgebHtvkTWr94g46IQ_Ddsbqw68PA_EHJ5GKo/edit?hl=en&pli=1&aut hkey=CPy9_NEH# Judge for yourself, but not ready for real world use yet. I'm guessing they'll probably try to implement a spell check on it. I'd say its about time, but probably isnt ready for primetime yet. Would also be nice to see OpenOffice make the jump, that's my personal fave. Well, Microsoft Office is really, but I dont want to pay for that. protozeloz can you not see it? I though I set it to public view. Okay, it's automatically putting a space there so you're going to have to copy that whole link and remove the space in "aut hkey". The key is getting cut off. Thanks I see is quite accurate on some parts but fails on other, but thats pretty good for a picture snapped, and it will get better with time :D are they allowing feedback on the feature?